Stairs are the steps arranged in a series to access the various floors of a building. A well-established staircase should have an easy, quick and safe mode of communication between the different floors of that building. 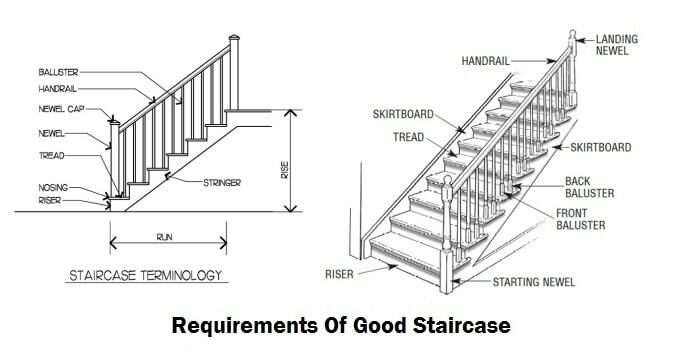 The following points should be kept in view to design and build a good stair. The staircase should be located at the right place in a building with adequate light and ventilation. In a residential house, the stairs may be provided near the main entrance. In case of a public building, it should be located at the central position for a quick accessibility. The width of stairs depends on the traffic flow and may vary from building to building. In public building, the width of stairs should be at least 6 feet and in a residential building, it should be 3 feet. The flight should provide a maximum of 12 and a minimum number of 3 steps. The maximum pitch for a domestic building should not exceed 42° and for a public building, it should not exceed 33°. The minimum headroom in a staircase should not be less than 6 feet 8 inches. The width of landing should be always greater than the width of a stair. Fire resisting materials should be used to construct the staircase for better safety. Balustrade should be provided in all open well stairs to minimize the accidents. Handrail must be used on both sides of wide stairs (When stair is wider than 44 cm). To build a safe and easy staircase, winders should be avoided, but if necessary it may be provided at lower end of the flight. Uniform dimensions should be provided to the rise and trade in each step. A well-proportioned ratio between the rise and the going is required to access the stairway more comfortably. 2. (Going in cm) × (Rise in cm) = 400 (approx). 3. In residential buildings, the average size of a step is used as (25 cm × 16) cm. 4. In public buildings, the average size of step varies from (27 cm × 15) cm to (30 cm × 13) cm. Also Read – Septic Tank Design Criteria. If u liked this article, then please share and subscribe to our newsletter.